Oblivion Sun is the brainchild of Frank Wyatt and Stanley Whitaker, founding members of 70’s Arista recording artists Happy The Man. HTM reformed in 1999 to headline Nearfest 2000 and they released their first CD in almost 25 years, “The Muse Awakens” in 2004. Frank and Stan recognized the difficulty in getting together to work on new HTM music due to personal schedules and proximity. They had amassed an abundance of material that they feared would never get recorded if they waited for HTM to record it. It was out of this reality that they began recording the duo project “Pedal Giant Animals”. The PGA project, with guest musicians Chris Mack and Pete Princiotto, became the seed for a new band…Oblivion Sun. 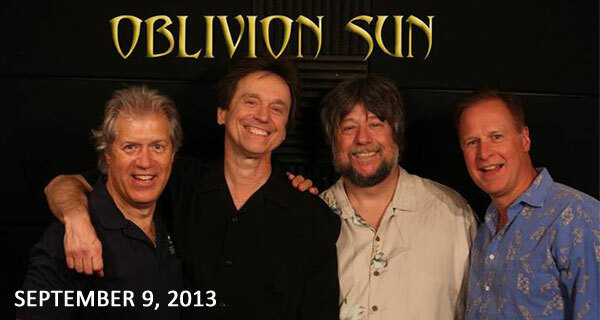 Oblivion Sun comfortably crosses many genres while staying true to their progressive roots. This is a band that’s not afraid to get downright funky at times and throw down some serious rock grooves and even improvisation. Expect a good deal of vocal content as well but fear not, this is still prog and fans of HTM’s lush arrangements will not be disappointed. The ensemble features the compositional and performance skills of all four musicians: Stan Whitaker on guitar and vocals, Frank Wyatt on keyboards and reeds, Bill Brasso on drums, and David Hughes on bass and vocals. Together, Oblivion Sun have created a powerful, dynamic sound that is sure to satisfy all prog fans, young and old alike. The band has quickly established itself as a forerunner in the ongoing evolution of progressive music. In January of 2013, the band released their sophomore effort entitled “The High Places.” This tour-de-force maintains the band’s instrumental progressive roots while expanding their songwriting style. They plan to tour in the U.S. and are looking towards Europe in 2014. They have put together a live performance set that will combine music from both Oblivion Sun albums and some prime cuts from the Happy the Man days. Mavara, is Iran’s first premier progressive rock band. The name Mavara translates to “beyond everything you think” which speaks to the essence of their music. The band was formed in 2001 by composer/keyboardist Farhood Ghadiri and over the years has had a fluid line-up of members, performing extensively in Tehran and Karaj. Because of their unique sound and talent, Mavara quickly gained notoriety in Iran, receiving acclaim from the Tehran Industry and Science University as “Best Rock Band at a Live Performance”. Additional honors include an invitation to perform for the internet music festival, “Teheran Avenue” in both 2003 and 2005. Their music is best described in terms of their influences, with a generous helping of Pink Floyd, Porcupine Tree and Marillion being the first bands that come to mind. In other words, more on the melodic side of Progressive Rock. Mavara began recording their first Persian language album, “Ultimate Sound” in 2003 which was released in 2005, and gained recognition in an article published on the website Zirzamin.se. Later in 2005, Mavara teamed up with the band Aavaar for a benefit show in Iran to promote the new album. It wasn’t long thereafter that the band began recording their first English language album, “Forgotten Inside”, which was released at a private concert in 2009. Among their first tour stops, was the Crescendo Music Festival in France during the summer of 2010. In 2013, Mavara released their epic third album “Season of Salvation”, on Transit Music Group Records [TMG] in the US and is currently touring and promoting the album here in the United States. Since arriving in the American soil, the band has been the subject of television programs [NH Chronicle/ABC Television, ‘Stir It Up’ on MCTV, etc], College radio live appearances [Tufts University, etal ] and countless magazine articles, The Hippo, The Union Leader etc, and most recently were featured in Spotlight Magazine where they graced the cover of the weekly magazine. Mavara was also invited to be one of 8 bands to perform at the prestigious “ProgDay Festival 2013” the longest running progressive rock festival in the world. A recent review of the new album states: “Season of Salvation” never rests on its laurels, it is quite impressive in structure, style, and overall atmosphere”; “These guys (and gal) impress whether they are focusing on ambiance or on a great jam”; “.. a fantastic album.” Jason Spencer on Progarchives, Aug. 2013 (4 out of 5 stars).